Are “Shopper” and/or “Collaboration” on your Strategic Pillars? For most organizations the answer is yes, but many are struggling with how to get any traction. It doesn’t have to stay that way. To succeed, Shopper and Collaboration need to be well-defined and go beyond transactional, one-off projects. Define Internal Strategies, Guidelines and Processes associated with their target consumer / Shopper, competitive differentiation, brand and category (including private label or store brands), category roles and strategies, tactical strategies and supply chain strategies. Identify Assets & Best-fit Business Partners, including data & tools, personnel and research. Not all collaboration is created equal and this is a critical step for any organizations who have “collaboration” on their corporate strategies for 2016. Train Multi-functional Teams on Category Management foundations, data and analytics, and category and Shopper understanding (see the FAQs later on in this blog). Once Retailers and Vendors have their teams working toward the same goals with a unified strategy, they are ready to collaborate externally based on the partnership guidelines they established in Step 1. 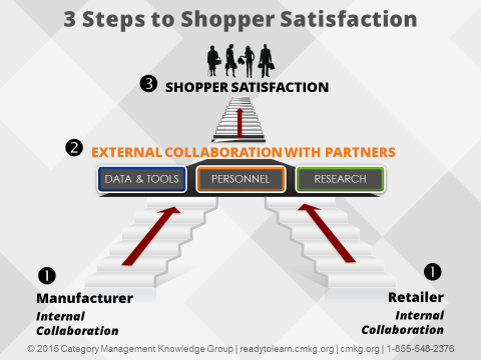 The Category Management Association has created a free whitepaper on “Strategic Collaboration for Shopper Satisfaction” that delivers big picture perspective on how Retailers and Vendors establish and maintain true collaboration. Through successful collaborative business partnerships between Retailers and Vendors, both can reach consumers with integrated Shopper Marketing across the omnichannel at any point in consumers’ Path to Purchase. Strategy& and PWC’s whitepaper on “Reimagining Shopper Marketing” identifies good models of brand building through omnichannel experiences. Q. Why has there been such a shift? in marketing? in collaboration? For years, Retailers have relied on Vendors’ marketing plans and activities to draw Consumers in search of national brands into stores. But now Retailers have their own private label brands they want to promote, and retail stores and the Internet have become prominent marketing tools. Conversely, Vendors have traditionally had brand-specific strategies that targeted their Consumer, but now this approach must be flexible enough to accommodate each Retailer’s unique requirements. Retailers now need much more marketing expertise, including a clear understanding of their Shopper and robust Shopper marketing programs. Vendors are now forced to compete in the Retailer’s arena, and each Retailer is different. Shifts in traditional media, Consumer expectations, digital media and Retailer strategies targeting their unique Shoppers, are also changing Vendors’ roles and actions. By understanding each unique Retailer’s marketing priorities, Vendors can learn where their biggest opportunities are. Because both Retailer and Vendor roles are changing, each must maintain consistent communications to Consumers, Shoppers and Buyers and that can only happen through external collaboration. Q. What is the Path to Purchase? The Shopper’s Path to Purchase describes the journey by which consumers discover, learn and experience a product prior to purchase. The path begins with the Consumer (the person who uses or consumes the product). Consumers may include household members, guests (or even pets) in the home, and “on-the-go” consumers (those using/consuming the product while at work, school, or social activities). However, less than 50% of purchase decisions are made at home by Consumers prior to the shopping trip. More frequently, purchase decisions are made by the Shopper (those who are shopping inside the brick-and-mortar or online Retail store). Since Shoppers purchase both for themselves and for others in the household, it is important to convert Shoppers into buyers through consistent Shopper marketing messages. Q. How is the “Target Shopper” defined? As you begin to imagine, understanding Shoppers’ lifestyle, financial, family and personal circumstances can create opportunities for Retailers to market more effectively to their most loyal, frequent, or heavy Shoppers. Q. What is a Shopper “Trip Mission”? Understanding the purpose for a Shopper’s trip (their “Trip Mission”) is critical for converting Shoppers into buyers in the Retailer’s environment. There are many shopping mission types that drive Shoppers to purchase — from the immediate “must-have” focus to a leisurely ”browsing” shopping experience. Shopper Trip Missions change frequently and depend on the specific retail environment, purpose of their visit, and unique lifestyle, financial, family and personal circumstances of the Shopper. Want to learn more about Shopper Marketing? Category Management Knowledge Group can help you, your team or your organization learn more through a single course or a customized program. We have some great category management training options available to meet your needs.